The SmartThings Hub (2018) must be connected using the SmartThings app for Android or iOS. During setup, you will have the option to connect the Hub via Wi-Fi or Ethernet. If you encounter issues during the setup process, follow the steps below. Important: The Hub cannot connect to open networks (networks without a password) or networks with a WEP password. If you need assistance creating the necessary type of password, contact your network admin or internet service provider. Connecting over Wi-Fi: Move the Hub closer to the router or try connecting the Hub directly to a port on the router using the supplied Ethernet cable. Connecting via Ethernet: Try a different port on your router and/or try a different Ethernet cable, or try connecting the Hub directly to the modem. Make sure you’re connecting the Hub directly to the router or modem and not to a repeater or a switch. If the Hub works connected directly to the modem, there may be an issue with your router. Note: If you are a shared member trying to connect to an existing Hub, please contact the owner to invite you to their Location. During the setup process, your phone will briefly connect directly to the Hub. Make sure you are within 15 feet of the Hub. If you’re connecting the Hub via Wi-Fi, make sure that the Hub is within range of your Wi-Fi network. Try bringing the Hub closer to your router. 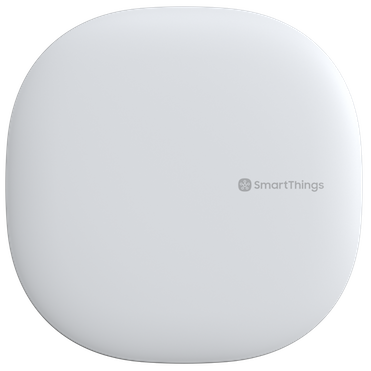 Note: In order to set up the SmartThings Hub, your phone will need to be connected to Wi-Fi or an active cellular data connection (Edge, 4G, 3G, or LTE). Try disabling Wi-Fi and using your phone’s cellular data if you’re still having trouble. 3. Check the LED status. If the LED is blinking or solid blue, the Hub may not have a stable internet connection. Reboot the router and/or modem. Note: If the LED is blinking red and green, the Hub is ready to connect to the SmartThings app. Note: If the LED isn’t blinking red and green, you may need to factory reset the Hub. See the steps below. 4. Restart the SmartThings app. On the phone, completely close the SmartThings app, and then re-open it. For Samsung phones, to completely close the SmartThings app, touch Recent to access the Recent apps screen, and then touch X on the SmartThings window, or touch CLOSE ALL to close all recent apps. 5. Factory reset the Hub. First, disconnect the power cable from the Hub. Using a pin or similar tool, hold down the Reset button on the back of the Hub. Continue holding the reset button while plugging the power cable back into the Hub. Continue holding the button for more than 30 seconds. When the LED switches from flashing yellow to solid yellow, release the button. The reset can take up to 10 minutes. When the LED begins blinking red and green, the Hub is ready to be set up again. Note: If you’re still having trouble after factory resetting the Hub, there may be an issue with your network configuration. Contact your internet service provider for assistance.